The new Sony Reader ebook reading device to be released this spring is poised to be the first widely successful ebook reader. I know first hand because I have one of the last generation of readers and the Sony Reader solves three of the main faults of previous readers. I now these issues first hand because these were the faults of the RCA book reader I owned a few years ago. Screen: The RCA version used a backlit LCD screen that was heavy, hungry and hard to see. The glass panel screen added considerable weight to the unit making it difficult to hold with one hand. The backlit LCD screen also required relatively large rechargeable batteries. This added bulk and weight to the reader. The new Sony Reader uses electronic paper that only sips power to change the screen image (turn the page) This means smaller rechargeable batteries last a long time. Also the high contrast electronic ink display features much higher contrast making it much easier to read text from it. Batteries: The last generation of readers that used LCD screens used heavy rechargeable batteries. 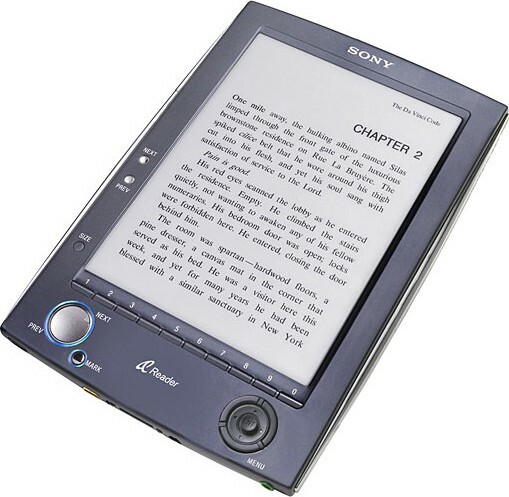 The Sony Reader uses lithium-ion batteries that can be recharged by an AC adapter or USB cable in 4-6 hours. 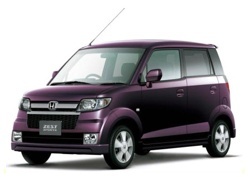 Weight: The previous versions were a good step forward. The ability to carry 10-12 books in a relatively small if heavy form factor was fantastic. This version weighs less then 9 ounces. That's less than a can of soda. The device is said to hold up to 80 books with more possible through memory cards. This could do for books what then iPod did for music. Imagine carrying around a large portion of your library much like you carry your music collection in your iPod? Anybody who says they wouldn't like it, they'd miss paper pages, they can't curl up with a screen, etc. has never tried it. I enjoyed a number of books on my RCA reader. I used it on airplanes. I curled up with it at bedtime. All the while I enjoyed being able to switch between a whole collection of books. To the doubters I say don't knock it until you try it. Robot Gossip reports that ABB has moved the headquarters of it's robot division from Detroit to China. ABB makes robots used in the assembly of cars. There are leading robotics companies in other parts of the word but this is very telling about the future of not just auto manufacturing but manufacturing in general. China is rising in many regards as a market, as manufacturers and as marketers. Are you watching China? There are trends that point towards preparing children for a future where China and the Mandarin language are a true global power. Everything from the trend of hiring Chinese nannies for children to the efforts of China to export the Mandarin language to schools around the world. More and more signs point to a future that involves a powerful China. Here's a cool way to enhance the experience of drinking a bottled beverage. Ipifini is looking to licenses the technology to beverage companies. 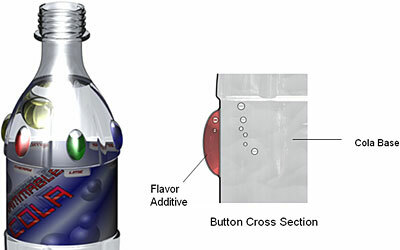 Plastic buttons containing flavoring, color and even scent additives are placed around the bottle. Users are able to select and press additive buttons to customize their beverage. Nice. I think we'll see this as a trend. The 20th century was all about standardization, the 21st century will be all about user customization. Technology has developed to the point where there is no reason why products, services and experiences need to be the same for everyone. Why should my Pepsi taste just like yours? We've seen this mass customization trend before with products like athletic shoes and even cars but this is mass DIY customization. Before mass customization has been a manufacturing system that allowed users to request special configurations of products. Mass DIY customization is about a end customer being able to customize the product with options or ingredients provided by the manufacturer. It plays into the desire of customers to have experiences of play and experimentation with a product. All we will need is a nice Web 2.0 social networking site to share tips, techniques and recipes for mixing up what the cool kids are drinking. Yesterday, I was doing my grocery shopping at a local big box retailer. Not Wal-Mart. Even though I am a marketing guy I got tired of playing the loyalty card price discount game that the local grocery stores play. It's just too much hassle to buy products the week that they are on sale and skip them on their off weeks. Wal-Mart is on to something with their always low prices strategy. The deeper you look the less you like what that strategy means but the idea of a steady price is a good one. So, anyway, I am at the store getting groceries and it's time to checkout. For those of us who can see and understand the future of how this can work and the efficiencies to be gained this is a frustrating time. I like many am a huge fan of the self checkout systems. Unfortunately, for a variety of reasons these systems are often offline. Whether it's technical issues, staffing or shrinkage issues I don't know. At best these are a transition technology waiting until the ground shift of Radio Frequency Identification(RFID) tags becomes a reality. Basically RFID tagging means adding a computer readable "tag" to each item in a retail store. This tag, usually a sticker or built into the product packaging, carries a unique identification code similar to the information in a barcode. Unlike barcodes RFID tags can be read by a scanner at a distance usually just about 3ft or 1 meter. Computers and scanners can "read" the contents of entire trucks or shopping carts in seconds with little or no human assistance. RFID tagging while controversial among privacy advocates will eventually win out as globalization and price pressures continue to drive costs out of the supply chain process. When RFID becomes commonplace the checkout process will be as easy as pushing your cart full of good through the exit door of the store. The door will be equipped with tag readers that will scan the contents of the cart and the credit card in the shoppers purse. Computers can total the former and charge the latter. The Last Shall Be First - Look around the store today. Who would you say are the least important people? You might say the greeters and the food samplers. These are often low paid part time employees usually friendly senior retirees. In some stores you still see baggers and cart attendants. When technology replaces the cashiers the only remaining people who have customer contact will be the greeters and product samplers. A huge opportunity will exist for people who can "host" and "MC" an entire store and customer experience. Reclaimed Square Feet - Gone will be the need for twenty or thirty checkout lanes that sit idle as the low overhead pressures keep staffing levels low in all but the busiest times. Replacing these checkouts will either be more revenue generating sales floor or smaller gross square footage in newly constructed stores. Store Merchandising/Stocking - Think about the last time you shopped a big box store? How many products did you select from a fixed store shelf vs. a pallet display? Many big box retailers have, following Wal-Marts lead, outsourced much of their stocking to their suppliers in the form of the palletized display. Suppliers provide their product stacked or arrayed on cardboard shelves all on a pallet that is moved from truck to stockroom to sales floor all by one worker in a minimum amount of time by use of a fork lift or skiff loader. When the labor cost savings of eliminating human cashiers combines with supply chain efficiencies brought by RFID implementation even greater automation will come to the stocking process. Computers throughout the organization will know exactly how much stock is in every store and shelf within the store. Imagine the increased efficiencies in the end to end supply chain with greater intelligence like this. Shopping Carts - When the products are smart through RFID tags there's no more removing the individual items for scanning at checkout. Entire cartloads will be scanned simultaneously. Without the need to remove items from carts bagging items disappears. A huge cost savings for retailers. This changes the whole game. Some consumers will simply carry their own reusable bags to the store like they do now. Some will bring their own carts to the store. Like strollers for children, Americans will enjoy their own self selected and customized shopping carts. Increasing concerns about germs and bacteria on public shopping carts are eliminated if shoppers are bringing and cleaning their own. 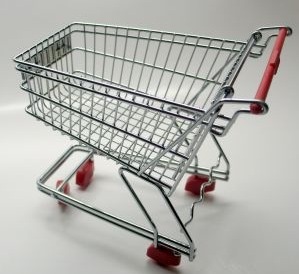 If shoppers are showing up to the store with their own carts retailers can reduce or eliminate the ones they supply. Even these costs can be recouped by leasing these carts to shoppers much like airport luggage carts are leased to luggage laden travelers. Flexibility is built in. Frequent shoppers can acquire smaller carts. Large families can use a wagon train of big carts, Disabled shoppers can use electric powered carts, families can use carts that accommodate and entertain their given number of children. Ripple Effects - Just as highways begat fast food restaurants and fast food begat cup holders in vehicles consumer owned and operated shopping carts or trollies will affect vehicle design. Automakers may be a winner from this trend as they can design carts that automatically integrate into vehicles like SUVs and Minivans. Even cars can feature storage pods that can be removed from a trunk area and used as shopping carts. Even home design will be effected. Shoppers returning with their loaded personal shopping carts will want to more that cart directly from their vehicle into their home. Ramps or step capable cart designs will be necessary. It's all about conservation of movement. Why move items from self to cart, cart to checkout counter, check counter to multiple bags, multiple bags to cart, cart to vehicle, vehicle to home, bag to shelves and cabinets when you can simplify it and streamline it to self to cart, cart to vehicle, cart to home, cart to shelves or cabinets. Time, effort and therefore money saved. The bottom line is that Wal-Mart is teaching the world to love always low prices. Technology will change and augment the shopping experience and those changes, the next biggest being RFID, will have broad effects on the experience of shopping. Some will hate the new experience just as some hate the way things work now. The RFID revolution is broad enough that it will bring changes to other retail formats as well. Big box retail will make it cost effective and smaller stores will build enhanced experiences on top of the efficiencies. Web services will rethink grocery lists. Delivery services will flourish with the new efficiencies. New entrepreneur opportunities will abound. Old ways will be replaced with new ways. The future will be different from the present. 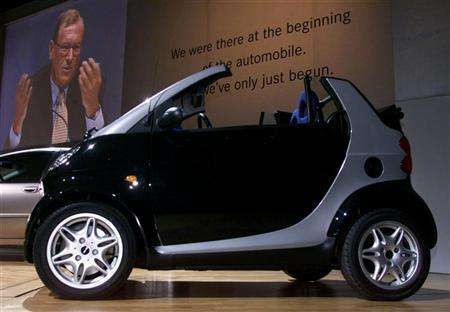 The trend is clear "Tiny is the New Big" Automakers of all sorts are adding new models of fuel efficient tiny cars to their line ups. These designs are promising to automakers for several reasons. Not only do tiny cars necessarily up their fuel efficiency averages by offsetting fuel guzzling trucks and SUVs these tiny cars also represent low cost entries into developing markets like India and China where car sales are booming. I'll say it again. It seems to me that carmakers are missing an opportunity with their tiny cars that quite possibly will hinder sales in the North American markets. As designed these tiny cars are only suitable for tiny people. Why are there no tiny cars designed to accommodate big people. I am talking 5'10"+ and 250-500 lbs. big. Big Americans are just as likely to like the fuel economy of tiny cars and their compact size for parking and maneuverability as smaller people. The difference is one of design. It's clear that putting big people in tiny packages has design implications. Why not design tiny cars for one large passenger. A single seat or two seat version of these tiny cars would be excellent for commuters and urban dwellers. Why not optimize the car for long range commuting by incorporating large fuel capacity, advanced navigation and communication systems. How about a version optimized for mobile professionals. 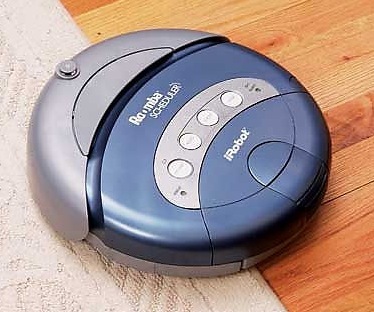 Why not make it easy to use a single passenger version as a mobile office space incorporating a copy machine, fax, onboard computers, WiFi, printers, cameras, etc. There is a lot to be done and a sales boom for automakers who respond to the market for tiny cars for big people. Pictured: The new Honda Zest which goes on sale in Japan March 1. If you are a trend watcher you no doubt have RFID tags on your radar. Specifically, we're keeping an eye on RFID tags to speed checkouts at retail stores. The idea is that product manufacturers will include tags either embedded or attached to their products. Retailers will use these tags to track inventory and facilitate faster checkouts for consumers. No longer will each item have to be scanned manually, entire car loads of products can be scanned simultaneously. The RFID in Japan blog reports on a trial in a Japanese convenience store that reports checkout transaction times of 10 seconds per customer! Imagine the applications. Is it any wonder that one of the most interested parties in the growth and development of RFID technologies is Wal-Mart. Wal-Mart is constantly looking for ways to squeeze costs out of it's operations. Not only are there huge supply chain efficiencies to be gained but there are significant in-store ramifications as well. The greatest of these is of course labor savings. Even more customers can move threw fewer checkout lines. Fewer cashiers will be needed. If you work for Wal-Mart you best start planning for what you will do next once automation takes your job. Oprah opens "Angel Lane" in Houston, TX Wednesday on her show. The first 12 families are shown their homes that are full of goodies from show sponsors all coordinated by Oprah's supper designer Nate Berkus. I guess I missed the show where she explained how the first 65 families were selected for homes. I think that's an important piece of information. No one person or organization can help everyone affected by hurricane Katrina but the question will always be asked how do you determine who gets help and who has to wait. It's also interesting to examine how much of this effort is about Oprah, her personality brand and her TV show and how much is true compassion for fellow Americans. Sure there is plenty of compassion from Oprah and her viewers through her registry. But what will the experience be for the 65th family to receive a house? Will there be food in the pantry and sheets on the bed? If the TV cameras aren't there will the yards have sod? Will the napkins have napkin rings? Does it matter? In a world where home makeover shows spend millions of dollars on individual families to create product placement filled ratings grabs for Television what has become of compassion for the sake of compassion? Oprah talks a lot about how many have suffered and continue to suffer. That was Tuesday's show. So is the help she's providing with her viewers, sponsors and Habitat for Humanity significant or are there better uses for the resources she can raise? Do you provide a lot of help to a few or a bit of help for many? Does TV make that decision? A landscaped cul-de-sac subdivision of 12 landscaped homes looks good on TV but would a village of 20 or 25 Katrina Cottages be a greater help to those profiled on yesterday's show who are in greater need. Could it be that the toasters from Target have something to do with it? An alternative to the camper like FEMA trailers, Katrina Cottages are small semi permanent structures that acknowledge the architecture of the region while being transportable and able to be factory fabricated. 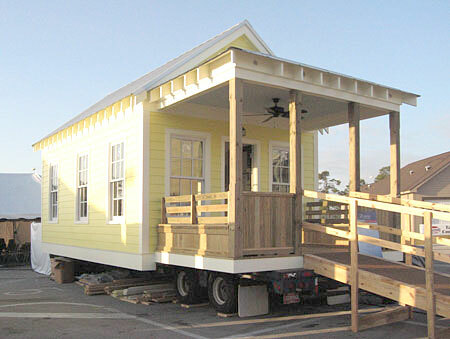 At scale the cottages are reported to cost the same as the standard FEMA trailers. 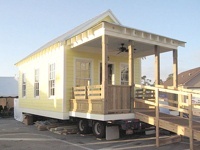 In five years are we still seeing FEMA trailers dotting regenerating communities or are we seeing clusters of Katrina Cottages and larger homes growing from the seeds of these modest cottages? Good alternatives and ideas abound for areas devastated by the storm. Perhaps more help could be provided by Oprah's viewers and charity organization if it weren't so much about Oprah herself and product placements. Many will say that whatever Oprah does to help is worthwhile and I would agree that something is more than nothing and it all adds up but the greater question of what compassion looks like in America is worth asking. Is compassion for those that need a hand up only good for ratings and TV cameras or is their still room for human to human compassion that's more about truly helping people. Oprah sent reporters to sit with those in tent camps and mold filled dirty devastated apartment buildings without roofs and plumbing but she sure was front and center on site when it's time to give out the spiffy new homes. Is it just me or is the advertising on NBC's Olympics coverage far better than anything we saw in the Superbowl? Seems a far better investment for advertisers. My recent favorites- Exxon Mobil with the kids aspiring to be ski jumpers and the Allstate baby boomers skating the hustle and totaling their Taurus. Any others?